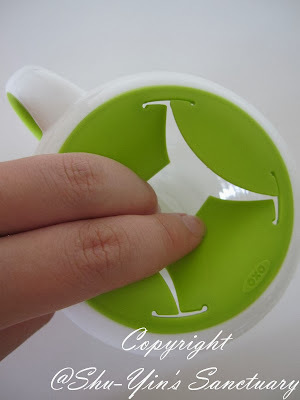 I find this one of the best invention ever - OXO Tot's Flippy Snack Cup. It has been Khye's best friend for quite some time already. This is how it comes like in its packaging. 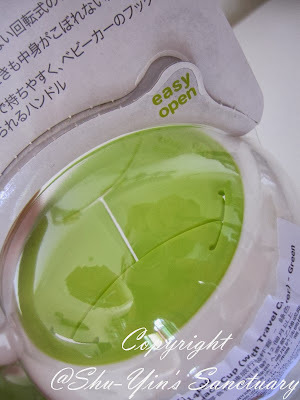 And just like the OXO Tot's Sippy Cup Set and the Divided Feeding Dish I've tried, it was very easy to open up the hard plastic. Just simply pulled the cupboard flap and it tore around the edge of the perforated line surrounding the Flippy Snack Cup. Awesome right? No need to meddle with scissors, or cut your hand, or even break your teeth trying to tear open the hard plastic! 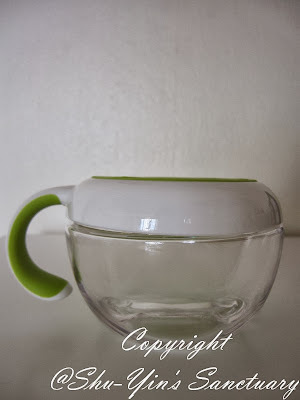 This is the front view of the Flippy Snack Cup. I chose the green colour, but it also comes in Orange, Aqua and Pink. 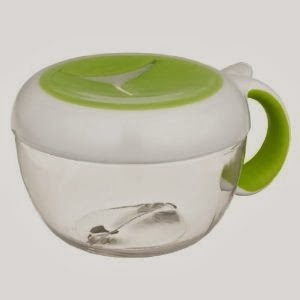 It also comes with a travel lid, to keep the food more fresh and secure. I've seen quite a number of flippy snack cups of other brands, but non I've come across that has a travel lid, so this is a plus point. Aerial view which shows you the flaps which provide easy access to the snacks. I like the non-slip handle too. 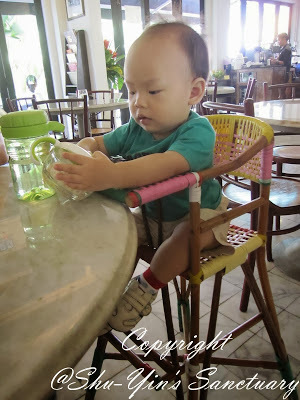 He can hold on to the handle easily. 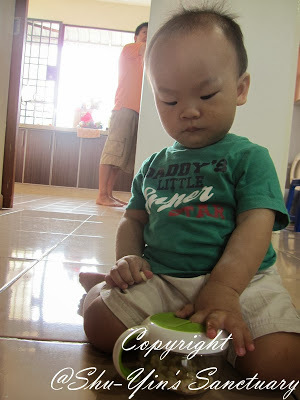 It can also be hooked on to the stroller or any other places that is easy for you to retrieve. 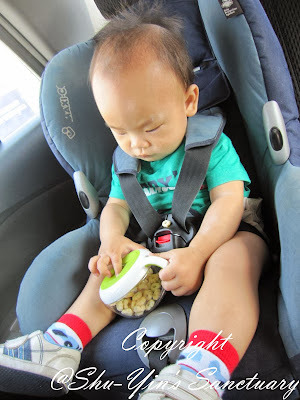 I sometimes hook it onto his stroller seat belt as Khye munch on his snacks so that it won't be dropped while he is sitting in his stroller. This is how you reach for the snacks. Pry it open with your fingers/hands. The flaps opens up easily. Now, let me show you how Khye does it. 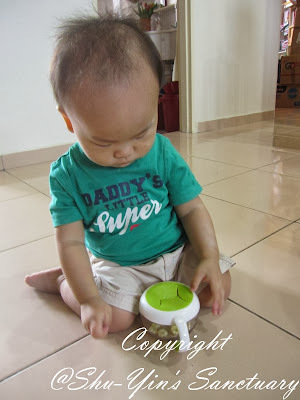 First, he holds the Flippy Snack Cup in his hands. 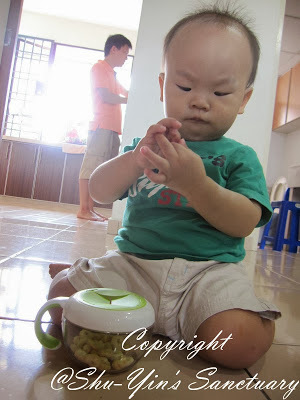 Then he reaches his hands into it and grabs some snacks in the cup. The flaps are really soft and comfortable. And there are no sharp edges that might cut into Khye's chubby hands and fingers. So I feel really comfortable knowing that they are soft and good. 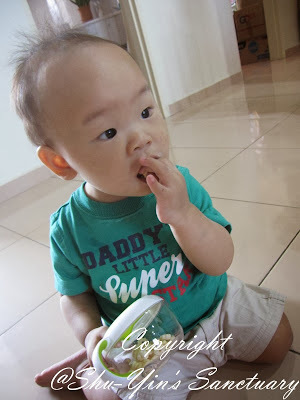 Thirdly, he puts the snack into his mouth. Tada. Done. And it keeps the snacks in place, and not strewn all over the floor. Not even when Khye shakes the cup like this. He can shake it all he likes and the snacks stays in it. 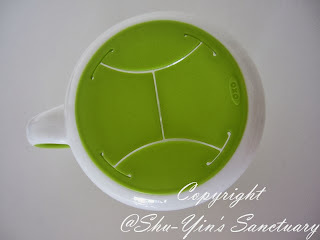 The twist on lid also won't pop open when the cup is dropped, or like Khye's case, banged on the floor! Very cool. 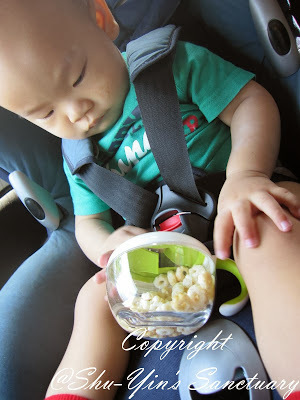 And when we are on-the-go, this Flippy Snack Cup proved to be so invaluable. 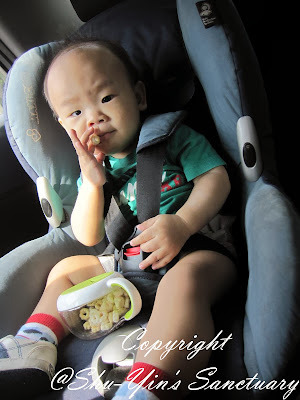 I usually don't allow my kids to snack in the car, because they will drop all the snacks and crumbs and make the car so dirty, especially for toddlers as they don't know how to eat properly. 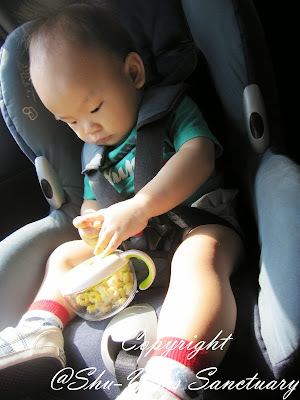 But with this Flippy Snack Cup, snacking in the car for Khye is made possible. 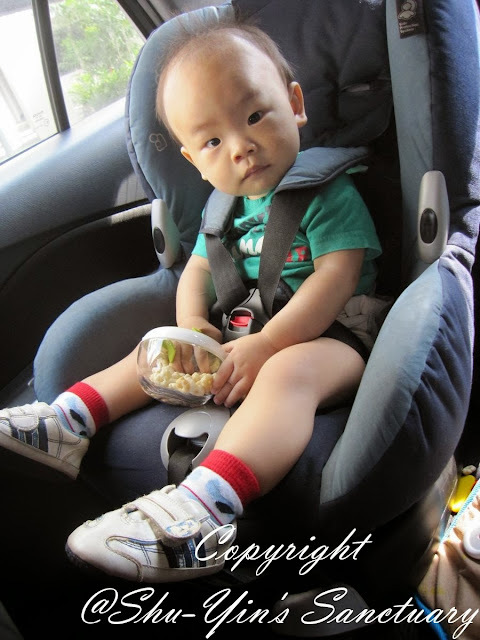 And that is also quite a life saver because that can make Khye stays quiet in his car seat when he started getting cranky. 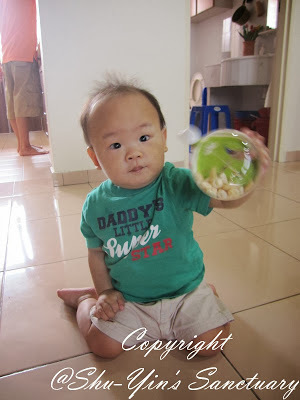 So I put finger food snacks in it like his puffs, and lets him eat by himself. See how he reaches for the snacks himself? And he feeds himself again and again. And after 15 minutes of self-feeding, his car seat is still tidy. No snacks all over it. 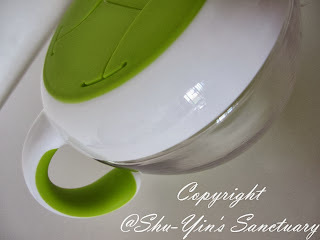 So it is great, and that's the main reason I'm gushing over this product! Khye's happy, and mummy's happy. Win-win! And it even works when we reached our destination. 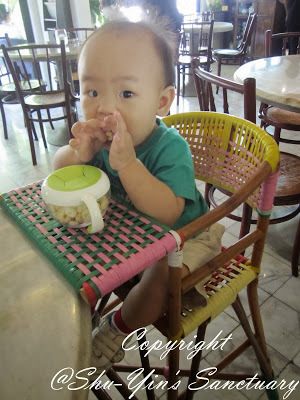 He can still snack in it when we are eating our food, or after finishing his own porridge. Although I don't have the luxury of owning a dishwasher, but I guess for those of you who do, you will be glad to know that it is also top rack dishwasher safe. 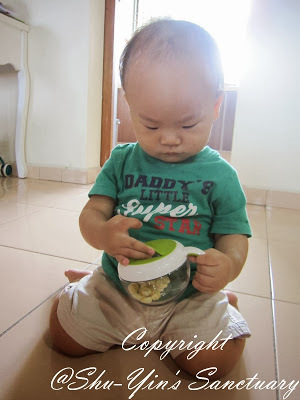 The only thing is that the travel lid, although it keeps the snacks more fresh and contained, it is NOT air-tight. 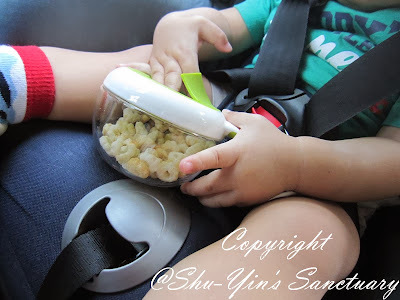 It is alright to keep the crunchy snacks there for a car ride or an outing long, but not for hours as it will go all soft. I guess this ain't an issue for cold climate countries as crunchy snacks don't go soft, but for us hot and humid Malaysia, crunchy stuff do go soft if it is not airtight. So this is the only thing I can think of that needs improvement. But other than that, this product is one of my favourite. 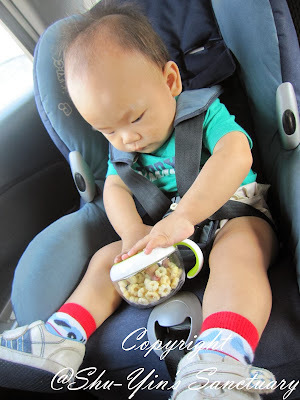 And I think every toddler needs one if you are a lazy mummy like me who is too lazy to clean up messy car seats or messy floors after every snack time! 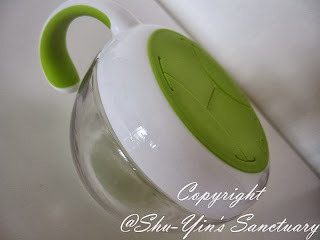 As usual, another great and quality product from OXO Tot. 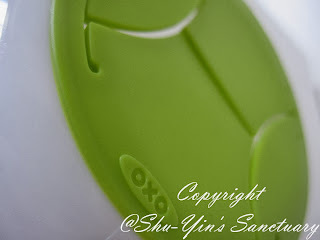 I am starting to love OXO Tot products. 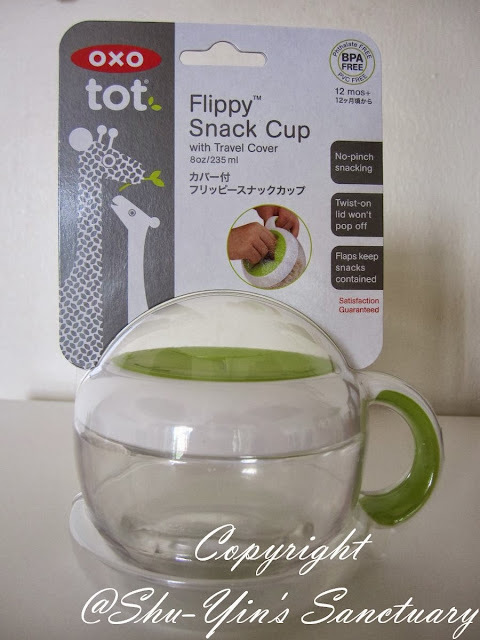 TO PURCHASE The OXO Tot's Flippy Snack Cup with Travel Cover retails at RM34.90. 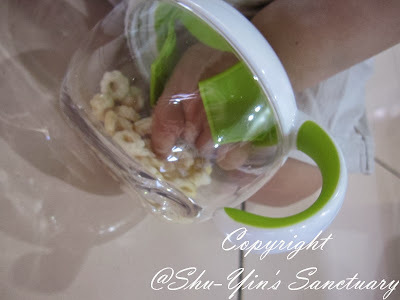 * Disclosure: I received an OXO Tot's Flippy Snack Cup for review purpose, but no monetary incentive was received. All text and opinions are of my own and represents my honest opinion of the product(s). 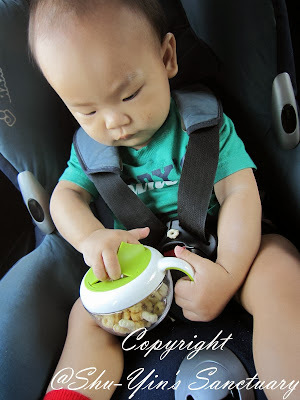 Its less messy with this OXO Tot's cup.